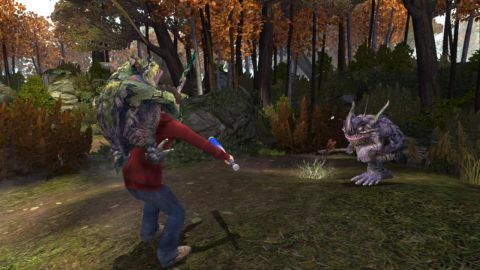 By most indications, the Nintendo DS installment of The Spiderwick Chronicles was designed with younger players in mind. The controls are easygoing, the hand-drawn art style is inviting, and the straightforward tasks are generally easy to handle. However, a few minutes in, after the same overpowered group of goblins sends you back to the "game over" screen for what feels like the tenth time, you realize something: The battles in this game are way too challenging. The explorative portions are fine. You use the touch screen to move around, tap on objects to interact with them, and generally go where the hints tell you to in order to make the story from the first Spiderwick book (and recent movie) unfold. Much of that wandering revolves around finding items that will unlock doors or convince monsters to help you. You'll also kill time tapping the screen to shake bushes, tree stumps, and other bits of suspicious scenery in search of fairy sprites. In true Pokemon fashion, these shiny creatures can heal you, clear away thorns and boulders from a path, and give you additional attacks to use in battle. Of course, the forests and meadows surrounding the Spiderwick home are loaded with ogres and goblins. When you encounter a pack of these beasts, you'll be taken to a battle screen where you exchange attacks in turn-based fashion. Your characters - Jared, Simon, and Mallory - usually get to attack first. Then, the enemies you're facing (as many as six) get their turn. So it goes, until one side is defeated. The problem here is your side is the one that's most likely to be knocked out. You never have enough health, you're frequently outnumbered, and the goblins dole out ridiculous damage. Some fairy sprites allow you to upgrade your characters' health and attack stats, but they're few and far between. Worst of all, when you lose a battle, you have to start the current area over from the beginning. It's a shame the battles are so brutal. Otherwise, the younger set would totally dig this game. The fetch puzzles aren't too taxing, the age appropriate dialogue is actually funny, and the overall presentation is best described as a comic book brought to life. All of the characters, scenery, and buildings look like they were penciled, inked, and colorized by hand, and then animated. There's also something to be said for the soundtrack, which is lighthearted and yet somehow manages to come across as spooky, probably because the zestier melodies tend to coincide with kidnappings and other strange occurrences. Still, it's tough to enjoy any of that good stuff when you're constantly seeing the "game over" screen. Some people may find that kind of oppressive difficulty refreshing, but most folks, including the game's intended audience, are apt to find it frustrating. Description This bland, by-the-numbers adventure would take an hour or two to finish if not for exasperatingly numerous fetch quests and a lame drawing minigame that you must complete 60+ times if you actually want to see the ending.